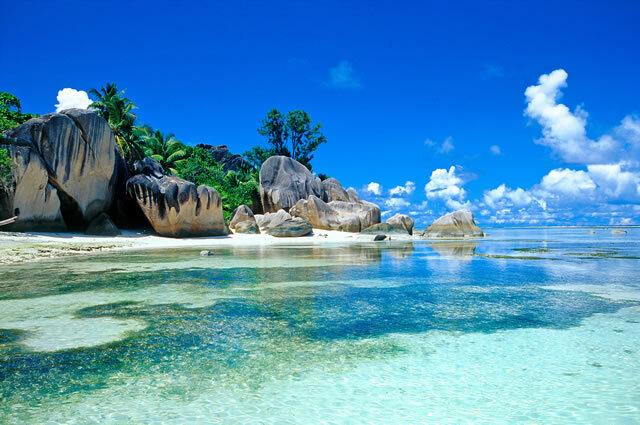 The Seychelles is one of the most popular tourist destinations in the world and a perennial favorite for romantics. The island is one of the world’s most understated wonders. Seychelles boasts of many beautiful sights and it would provide the kind of holiday you never want to go home from. The Seychelles’ largest and main island, Mahe, is home to the capital of Victoria and about 70,000 people (almost 90% of the nation’s total). Still, the island retains its idyllic beauty, with 3,000-foot mountains and scores of gorgeous beaches. Many plants, including the so-called Jellyfish Tree and several rare orchids, are unique to Mahe’s shores. The Seychelles Natural History Museum, the Botanical Gardens and the Codevar Craft Centre, all in Victoria, are not to be missed. For those who would like to have something a little more exciting, there are three nightclubs on Mahe. Another of the Seychelles’ most popular destinations, Praslin, is home to fantastic beaches and intimate hotels and resorts. Soak up the sun in style while you keep a sunglassed eye out for the very rare bird species that dwell on Praslin, including the Seychelles bulbul and the black parrot. Praslin National Park in the island’s south contains the spectacular palm forest of Vallée de Mai. Divers love the ancient coral reefs off Praslin’s shores. A day on foot is ample time to see Victoria, one of the smallest capitals in the world. Located on Mahe, one of the Seychelles’ 115 granite and coral islands, Victoria is the republic’s business and cultural hub. At its center sits the Victoria Clocktower, a national monument reminiscent of London’s “Big Ben” that has kept ticking since 1903, unaffected by the modern glass and concrete development around it. Visit the local art galleries and craft markets to soak up the city’s friendly charm. Arriving at La Digue feels like sailing straight into a painting, brimming with brush strokes of blue, green and tan. The beaches here are spectacular, particularly Grand Anse and Anse Source d’Argent, which is strewn with pink granite rocks. Visit Seychelles Today. It’ll be a vacation you’ll never forget.